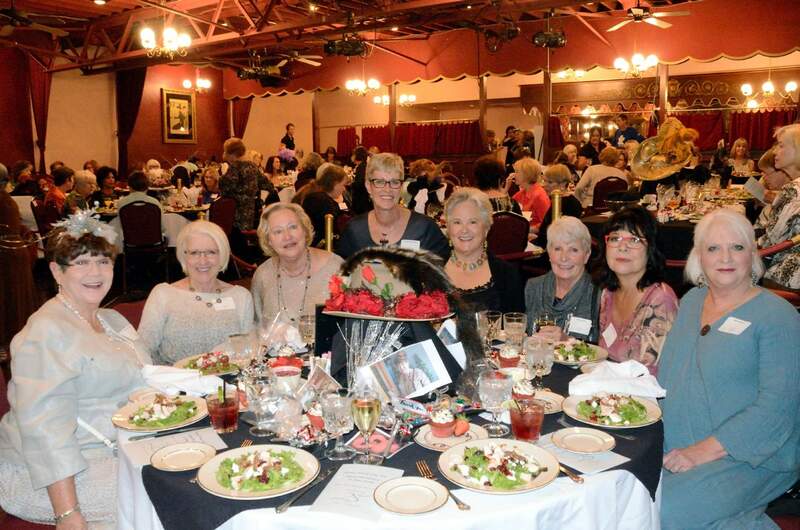 Seated at Table 1 at the Durango Friends of the Arts Luncheon celebrating the organization’s 25th anniversary are, from left, Caroline Todd, Mary Orsini, Nancy Macho, Kristy Householder, Carolyn Plested, Donna Cook, Bobbye Myers and Billie Gardner. Todd was a founder and the first president of the organization. The luncheon was held in mid-October at the Strater Hotel. 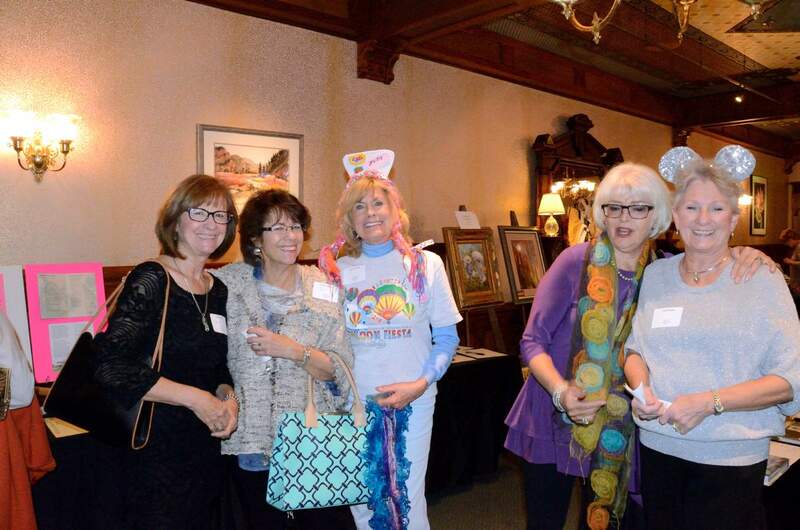 From left, Dottie Robinson, Judy Fairchild, Jane Mercer and Chairwoman Carol Bruno celebrate an active and colorful auction at the Durango Friends of the Arts Luncheon held in mid-October at the Strater Hotel. Organizing committee members such as Bruno, right, wore sequined mouse-ear headbands so people would know who they were. The centerpieces on the tables at the Durango Friends of the Arts Luncheon included winning hats from contests held in years gone by along with photos from some of the many fundraisers members have held over DFA’s 25-year-history. The 2016 luncheon was held in mid-October at the Strater Hotel. It would take some serious research to figure out how many times yours truly has written about the Durango Friends of the Arts in the 16-plus years of the Neighbors column. But I know it’s been many, because these passionate supporters of the arts know how to throw a party. That was obvious at DFA’s annual Fall Luncheon and Silent Auction held mid-October at the Strater Hotel. 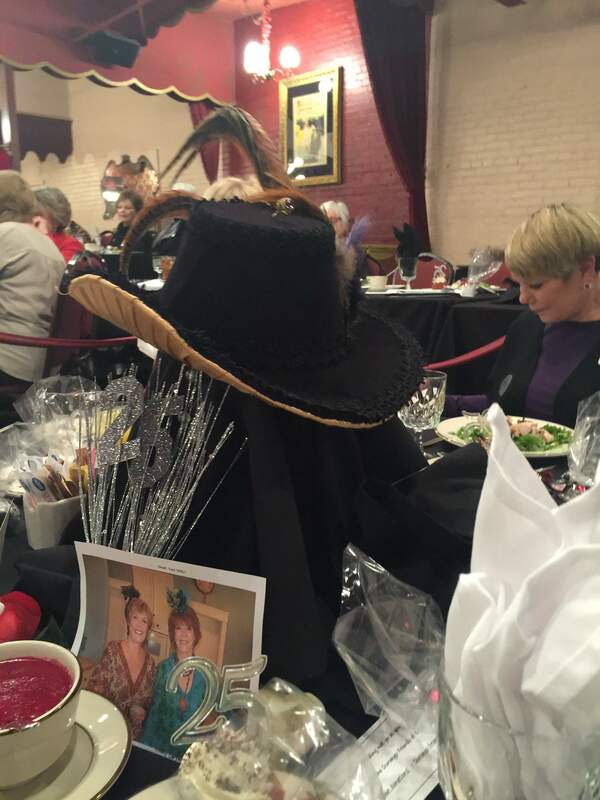 With the theme of “Girls Just Want to Have Fun,” the 25th anniversary of the organization was a trip down memory lane, with photos of fundraisers through the years and contest-winning hats from previous luncheons as centerpieces. Members glitzed it up with lots of silver, crystals and sequins. One cute touch was that all organizing committee members wore sequined headbands with sequined mouse ears on them. Those talented ladies included Chairwoman Carol Bruno, Sonya Bayley, Carol House, Myriam Palmer, Christine Rachlin, Susan Weirather, Mary Kay Lambert, Marian Pierce, Carol Treat, Judy Fairchild, Karren Little, Rhonda Polsfut and JoAnn Trimberger. The event began with an arty and oh-so-chic silent auction featuring about 100 items. Merchandise chairwoman Susie Ammann drafted her husband, Dan, to help carry in items with the DFA logo – such as reusable shopping bags – and more glitz, the groups’ popular glitter ballpoint pens with a stylus on one end. (You have to see them – I greatly enjoy glamming up my writing at home with my blue and green versions.) Merchandise sales added almost $1,300 to the Grant Fund. Guests then moved into the Henry Strater Theatre for a luncheon of chicken salad with glazed walnuts and other toppings followed by a red velvet cupcake. Party favors included chocolate, perfect for any occasion, and the silver version of the glitter ballpoint pens. Little, who organizes great programs for the group’s meetings, put together a presentation perfect for the occasion. Winners from Dancing with the Durango Stars, a fundraiser for Durango Derailers, and the Durango Voice, benefiting Manna Soup Kitchen, entertained the sold-out crowd. With the help of Leslie Carlson, dancers Jason Chapman and Jennifer Story (2015 winners) performing their award-winning waltz; Blake Knoll and Autumn Von Flow (the 2016 winners) with the West Coast swing; Chapman, with partner Jaccinda Moffat, nailed the Argentine tango; and Cheo Hernandez (second in 2016) and Charlotte Lensen (third this year) swung their hips with the salsa, and all got the audience’s blood pumping. And while singer-songwriter Cara Keyser may not have won the Durango version of “The Voice,” she more than entertained the crowd, singing a mix of her own pieces and popular music. In a moment of synchronicity, she sang Bob Dylan’s “Meet Me in the Morning.” He had been awarded the Nobel Prize for Literature the day before. Keyser, 19, is a psychology major at Fort Lewis College planning to use music and outdoor activities in working with clients on the autism spectrum. Her dad drove down from the Front Range for her performance, joining the event’s first-time ever all-male table. Keyser also brought in some support from fellow FLC students Ava Worm on vocals and “Fiddler Joe” Bruemmer on the violin. The guest of honor – dubbed the queen of DFA – was Caroline Todd, one of the founders of the organization and its first president. Longtime member Cindy Cortese, famous for her crafty accessorizing, made Todd a scepter for her reign. Cortese drove from the Denver Metro area with current DFA President Tina Marie Trump to attend. The final tally for the day was more than $11,000. And while it was the largest fundraiser of the year for the all-volunteer organization, it was far from the only one. Members revved it up this year, offering game days, Mah-jongg lessons, pie sales at the Farmers Market, a garage/estate sale, American Idol watch-party, art sale, historic walking tours, a Zumba class and more. The Grant Committee will make a recommendation in the coming months to DFA members about how to spend all the money raised, supporting artists and arts organizations.